Significant historical documents are at the mercy of time. Often fragile and holding important and irreplaceable information, it is crucial that these documents be both preserved and accessible. Handling, exposure to light, and fluctuating environmental conditions all pose significant risk to cultural heritage materials. Hence, it is important that these documents are at least digitised, not only as a record, but also to reduce the need for handling and exposure entirely. 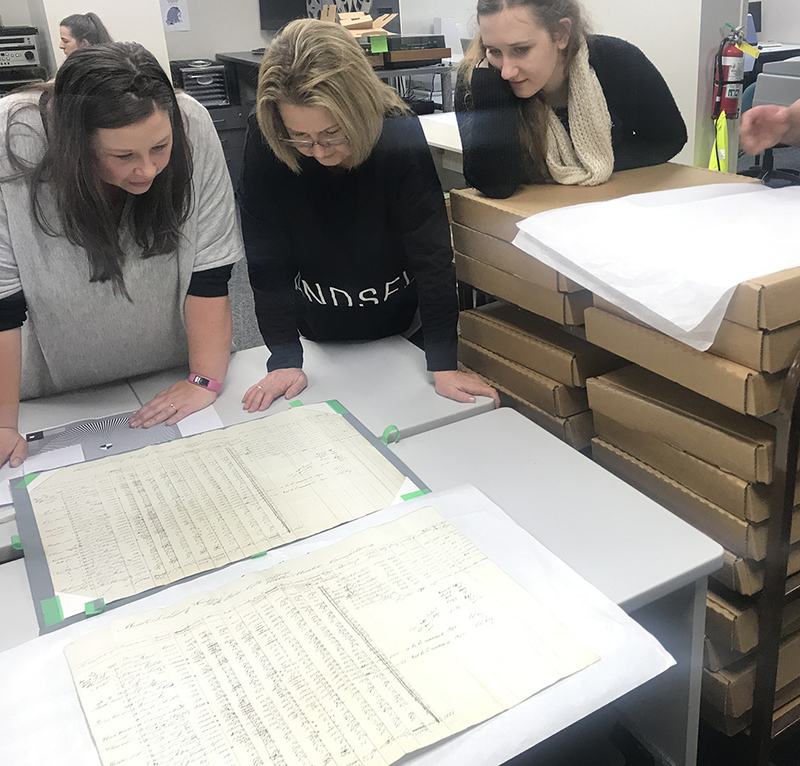 Beyond this, where study, handling, documentation, exhibition and display is desirable, replicas can be produced in place of an original, providing a safe solution for the original document. We were recently approached by one of our customers who has a significant family heirloom of an early insurance policy document for a woollen and worsted manufacturing company in Manchester dating from the early 1870s. Our customer wanted to share and display this precious document with their family but did not want to risk damage to the original by putting it on display; producing a replica became the clear solution. Our team digitised the document, printed it onto high quality textured paper and our very talented replica artist Daniel Reeve applied conditioning to the paper to replicate the original. 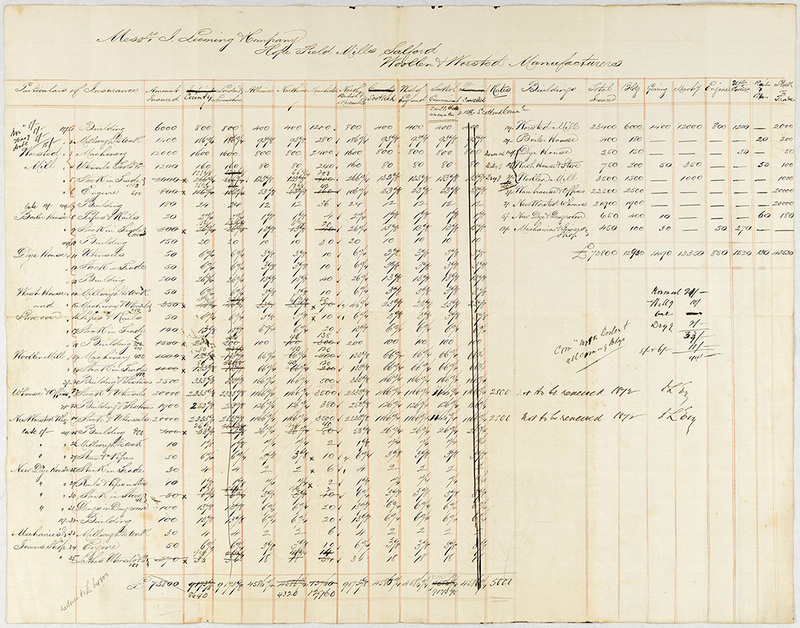 “My great-great-great grandfather was an owner of the company, and the document has stayed in my family ever since. While in reasonable repair for its age (about 145 years old) the original document was kept folded up amidst a bunch of other family documents in an old metal top hat box and was showing signs of wear and tear. Our team initially captured a high quality digital image on our large format Cruse scanner with balanced lighting. An additional two images were captured with raking light to highlight the creases and folds to help inform the replica artist of the textural details that he needed to recreate the document texture. 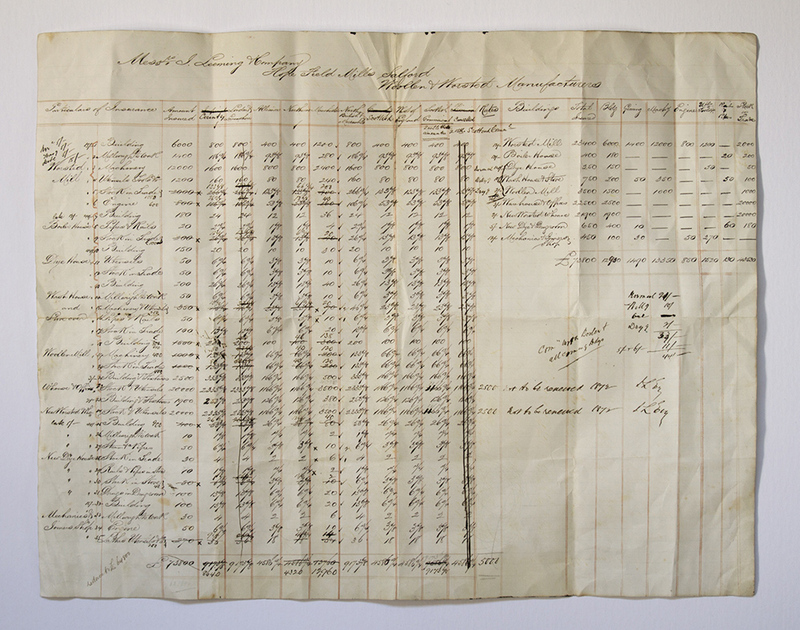 This was a vital part of the capture process as the original document could not leave our premises. Using our in-house Epson Stylus Pro 9900 printer we produced a colour corrected print onto Enhanced Matte paper that was a close reproduction to the original. 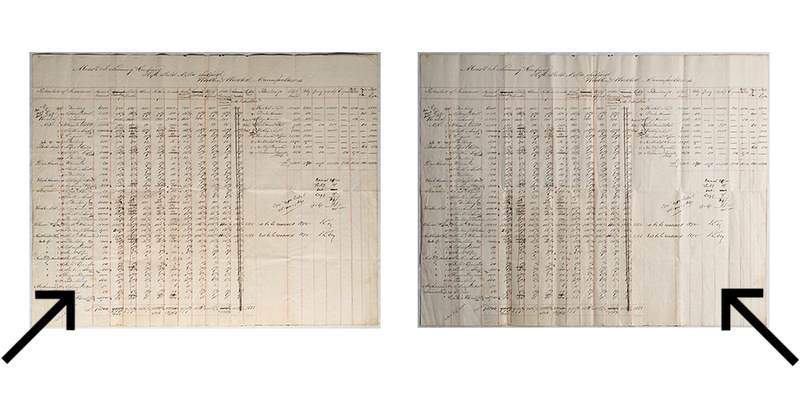 Merely creating a flat reproduction of the document would have been sufficient enough for duplicating the information. However, the art of creating a replica brings with it the authentic and realistic “feel” of the document that can ensure the “copy” has the viewing significance and respect of the original while allowing the original document to stay safe and preserved in the appropriate storage and environmental conditions. Considering that it was a print, it was flat and easy to distinguish from the original, at this point it was only a reproduction. To transform the reproduction into a replica, it needed a significant amount of textural and ageing work from our replica artist. Due to the significance of the document, the original could not leave our premises and therefore the artist needed as much information and detail faithfully reproduced from the original as possible. Daniel took the print and our digital images back to his studio where he studied each crease, fold and bend and respectfully duplicated those details onto the printed copy. 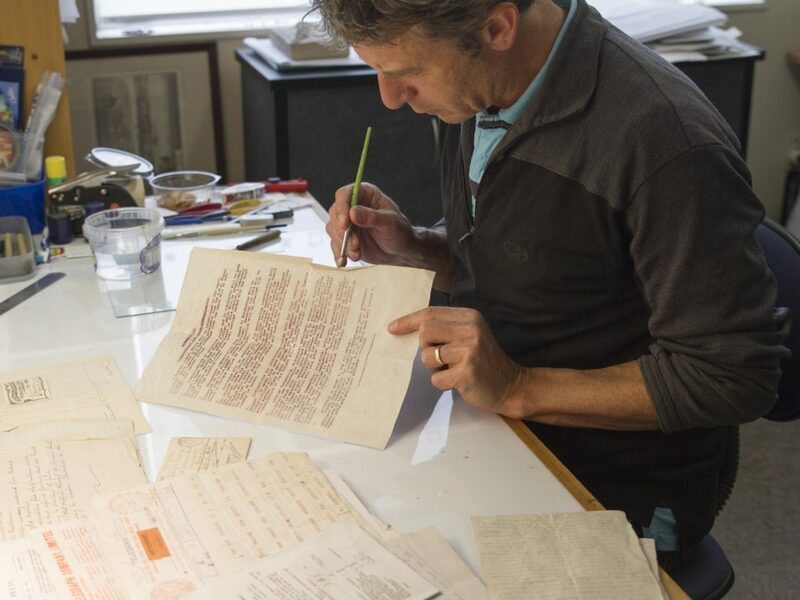 The textures and delicate folds in the replica document provide a realistic and authentic copy for an audience to view and appreciate the provenance of the original. “It is surprising what a difference a bit of contouring, creasing, and distressing can make, turning a flat print into a striking replica. Time and time again I have found, each time I make a replica – the Treaty of Waitangi, the Malone documents, historical wartime newspapers, the 1835 Declaration of Independence, and this insurance document – the small details make for an amazing transformation, resulting in pieces that look so real, it surprises even me! The edges come first, whether they’re cut straight, or torn, or rat-eaten, or conserved, I re-create the look, by cutting or tearing, and if necessary, abrading. The edges also need to be painted, to hide the white line of the replica paper. I match the paint to the colour of the document, varying it as the edge changes, with its local stains and aging. Tears, punctures and other piercings get the same treatment. Painting of the reverse side is sometimes necessary too, where paper edges curl, or are permanently dog-eared, showing the back of a page. General crumpling by hand is next, if required, to match the condition of the subject. To find out more about Daniel Reeve and his craft, visit his website here. “NZMS produced this exceptional copy which, on viewing, is almost indistinguishable from the original. I have had the replica framed, which means it is now safely and readily available for me and future generations of my family to view, while leaving the precious original to lie safely conserved in the dark. Our team enjoyed playing spot the difference! Preserve and enjoy your history with the confidence of eliminating further damage to your original by creating a replica. Contact our Replica experts today.